Chimpanzees are our closest living relatives. They share about 98% of genes with us. It is thought that humans and chimps evolved from a common ancestor who lived 4 to 8 million years ago. Males weigh 28 to 70 kg, and females 20 to 50 kg. When standing upright, they are about 0.7 to 0.96 m tall. Females are slightly smaller than males. Chimpanzees move on all fours. As arms are longer than legs, chimps walk on the knuckles of their hands and the soles of their feet. However, they can also stand and walk on their back legs for more than one kilometre. Fingers and toes are long and have opposable thumbs, giving them the ability to use their hands as “hooks” while swinging from branch to branch, and to grasp objects. Brown to black hair covers most of the body. The skin on the face, ears, palms, and soles of the feed is bare, varying from pink to black in colour. The ears and mouth are prominent, and they may have whiskers on their chin. Infants have very pale skin and a white tail tuft, which disappears after childhood. 10% of the sale price of this neckwarmer is donated to the NGO MONA Foundation. For further information about the work carried out by MONA Foundation, take a look to this page. Four subspecies of Chimpanzee have been identified, showing differences in appearance, distribution, and behaviour. Pan troglodytes troglodytes in Central Africa. Pan troglodytes verus in West Africa. Pan troglodytes schweinfurthii in Congo Basin. Pan troglodytes ellioti in Cameroon and Nigeria. Chimpanzees used to be found from eastern to western Equatorial Africa. Today they show a discontinuous distribution from Southern Senegal to Western Tanzania and Uganda. Chimps still have by far the widest geographic distribution of any great ape. Although occurring in more than 20 African countries, today only Gabon, Central African Republic, Republic of Congo, Democratic Republic of Congo, and Cameroon have significant numbers of chimps. They are possibly already extinct in Benin, Burkina Faso, Gambia, and Togo. Chimpanzees are found haphazardly across the forest belt of Africa. Their typical habitat is tropical rainforest. However, they are also found in quite arid areas, such as woodland, savannah, or farmland. Altitudinal variation is also great, with chimps living from sea level up to 3,000 m above. Even though they usually move on the ground, during the day they mostly stay in trees,where they sleep, eat, and socialise. A popular female becomes the nucleus of a multi-male party. The dominant male controls sexual access to a female, preventing other males from mating with her. A male leads a female away from the community range. Breeding occurs throughout the year. Females have a 35-day reproductive cycle, and males copulate with them when they are receptive. The first parturition generally takes place when females are 13-14 years old, with gestation lasting about 8 months. Females can remain reproductive into their late 40s. When the infant survives, the time between births averages 5-7 years. Females do not reproduce frequently because offspring rely on them for milk, protection, and education over a lengthy period. The norm is a single infant, but occasionally twins are born. For the first 6 months, the young clings to its mother’s belly. After that, it rides on its mother’s back. Baby chimp weans at 3.5-4.5 years. Young are reliant on their mother until they reach puberty, normally at 7-8 years old. During this period, they learn how to groom, make nests, find food, and use tools. They may maintain social bonds with their mother for the remainder of their lives, especially mother-daughter bonds. Although males can be quite gentle and playful with young, they do not provide any direct parental care. They give young indirect care when patrolling borders to chase away potentially dangerous male strangers. At the turn of the century, about 2 million Chimpanzees lived in African forests. Current estimates for the wild population range from 170,000 to 300,000 individuals. There are also many chimps in zoos, research facilities, and rehabilitation centres around the world. The ones that live in rehabilitation centres were previously used in advertising, entertainment, or were kept as pets. Chimpanzees are omnivores, meaning they eat both plants and animals. Fruits form about half the diet. They typically supplement it with leaves, stems, seeds, flowers, bark, pith, honey, mushrooms, resin, eggs, and insects (especially termites). Occasionally they hunt cooperativelyto kill and eat medium-sized mammals, such as bush-pigs, other primates, and young antelope. Soil is sometimes consumed, probably for the minerals it contains. They might also eat plants with potentially medicinal value to relieve stomach pains or reduce internal parasites. Pan troglodytes is diurnal. It spends the bulk of its time foraging, with peaks of activity in the early morning and late afternoon. Diet varies seasonally and geographically. Chimpanzees are powerful, agile when moving among the trees and have an exceptional intelligence. Spending considerable amounts of time in trees keeps them safe from land animals. 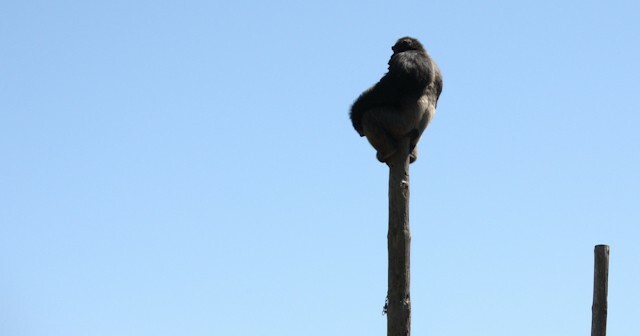 Despite all this, they have few natural predators who are able to climb trees. These are leopards, the largest snake in Africa (African Rock Python), lions, and martial eagles. The young are the most vulnerable. However, humans are by far the Chimpanzee’s number one enemy, not only because they destroy their habitat, but also for hunting them, even though this is illegal. When the approaching enemy is spotted, loud warning calls are emitted to their group mates to enable a quick escape. When confronting predators, they utter screams and use whatever objects they have at their disposal to scare the predators away. If the animal still does not leave, they quickly escape through the trees. Average lifespan in the wild: 40 to 50 years. Maximum lifespan in captivity: over 60 years. 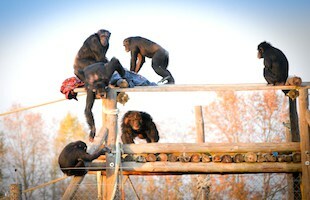 Chimpanzees have been the focus of many behavioural investigations, both in captivity and in the wild. This is because they are so closely related to humans and show such intelligence. Chimpanzees are highly social animals. They live in communities formed on average by 35 members. The largest known community has 150 members. These communities split into smaller groups of up to 10 chimps. Groups travel alone and just come together from time to time. The members of a group change frequently, as individuals wander off on their own or join other groups. Males usually remain in their birth group and spend long periods close to other males. When mature females are not in oestrus, they frequently travel alone or with their dependent offspring. Many community members come together when a sexually popular female comes into oestrus or plenty of fruit is available. The only individuals who can move freely between communities are adolescent females. They may transfer to a new community permanently, or move back to their own birth group once pregnant. Every night Chimpanzees build themselves sleeping nests from scratch. These are constructed high in trees by bending and breaking stems and interweaving them with foliage to create a thick and bouncy structure. Mothers share their nests with their unweaned offspring. Grooming consists in close visual checking and manipulation of the hair with fingers and extended lips. Bits of dirt, dead skin, parasites, and embedded objects are removed. Both self-grooming and mutual grooming are common. This activity also helps to establish and maintain social relationships, as well as calm nervous individuals. Communities are led by a dominant male (the alpha). His status allows him to take food from subordinates and monopolize sexual access to females. Because of these advantages, males compete for it. The alpha male is usually between 20 and 26 years of age. Other factors that determine dominance are physical fitness, aggressiveness, ability to form coalitions, and intelligence. Chimpanzees can communicate through a variety of calls. Each one is tied to a particular emotional context, such as the excitement of arriving at a food source or moments of deep fear. The pant-hoot is one of the best known of their vocalizations. It serves as individual identification, and allows chimps to locate one another even though they may not see. Some Chimpanzees have been trained in captivity to learn and express words using sign language, and have been able to use a large number of signs and symbols. For example, one chimp described a cucumber as a ‘green banana’! However, it does not appear that they could communicate with what we humans would call language. Pan troglodytes also uses postures, gestures, and facial expressions to communicate messages and emotions. For instance, if a chimp fully uncovers its teeth so that gums are showing, it is not what we would perceive as smiling; in fact, this gesture indicates that it is frightened. Another interesting example is what males do to proclaim their dominance. They clap their hands, stamp their feet, drag branches as they run, and throw rocks. Communities live in fixed home ranges. Their size varies greatly depending on the habitat quality and the number of individuals in the community. Home ranges are smaller in forest and woodland than in savannah habitats, where resources are spread out. The smallest range known is 6 sq. m. and the largest is 560 sq. m.
Chimpanzees make and use tools to accomplish tasks associated with feeding, drinking, cleaning themselves, and as weapons. Different plant parts are used to fish ants and termites from their nests. Leaves are used as napkins and, after chewing them, as sponges to sop up drinking water. Stones and sticks are used as hummers to crack nuts and shells. They might also be used to intimidate others. Most disputes within a community can be solved by threats rather than actual attacks. However, sometimes physical fighting takes place and can result in lethal injury. The males in a community regularly patrol their boundaries. If they encounter individuals of a neighbouring community they may attack them with extreme brutality. Chimpanzees are at great risk of extinction in the wild in the near future. They have already disappeared from some African countries and are near extinction in many others. They are fully protected by national and international laws in all the countries of their range. 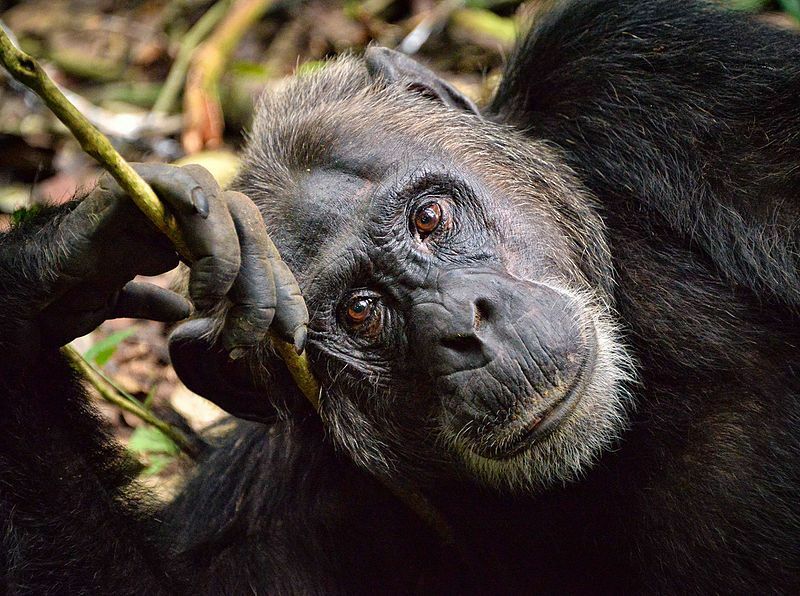 It is illegal to kill, capture, or consume Chimpanzees, or their body parts. 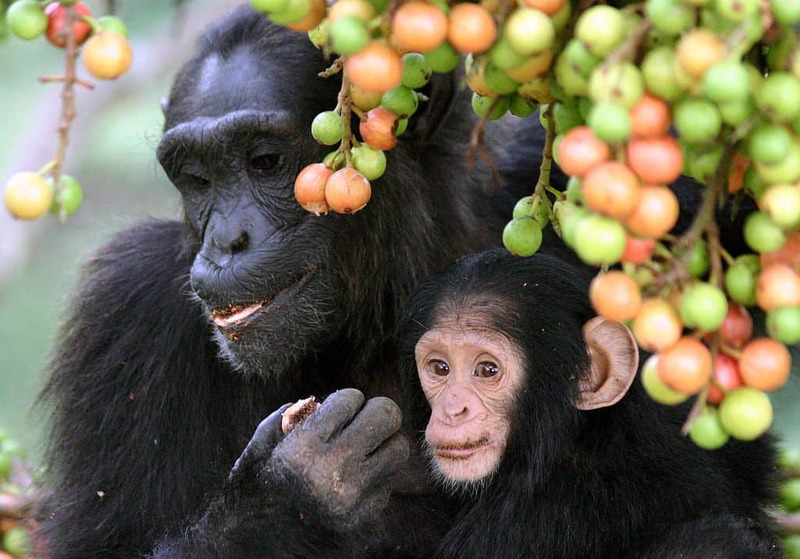 Poaching is the biggest threat to most Chimpanzees. Hunting for bush meat was once a subsistence activity. Today this has become a profitable business, as some urban residents pay high prices for it. When chimps are killed for meat, their offspring are frequently taken alive and sold in the cities as pets. In addition, sometimes they are injured or killed in snares set for other animals. Some people also kill or poison them to protect their crops. About 1,000 confiscated chimps are now in sanctuaries in the countries of their range. 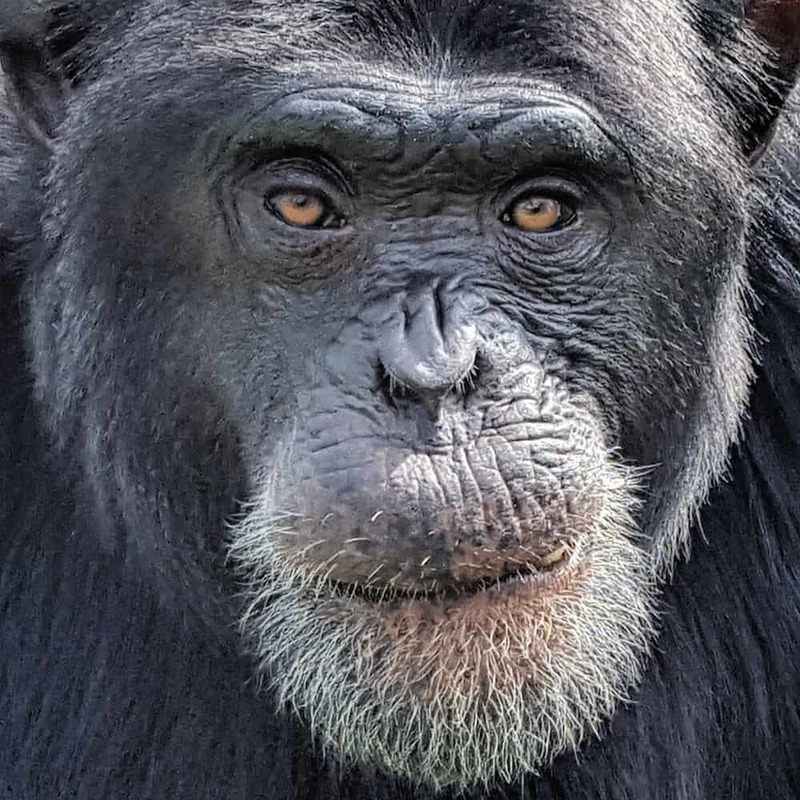 Chimpanzee habitat has reduced and fragmented severely due to the conversion of forests to farmland, industries of extraction (logging, mining, and oil), and huge road projects. It should be emphasised here that Africa is facing an expansion of large-scale oil palm plantations driven by the international demand of this product. All these activities increase hunting pressure, as access to remote forest areas improves. Infectious diseases, especially the Ebola virus, also kill large numbers of Chimpanzees. Female chimps may give birth to as many as 9 offspring during their lifetime, but only 1/3 of them survive beyond infancy. 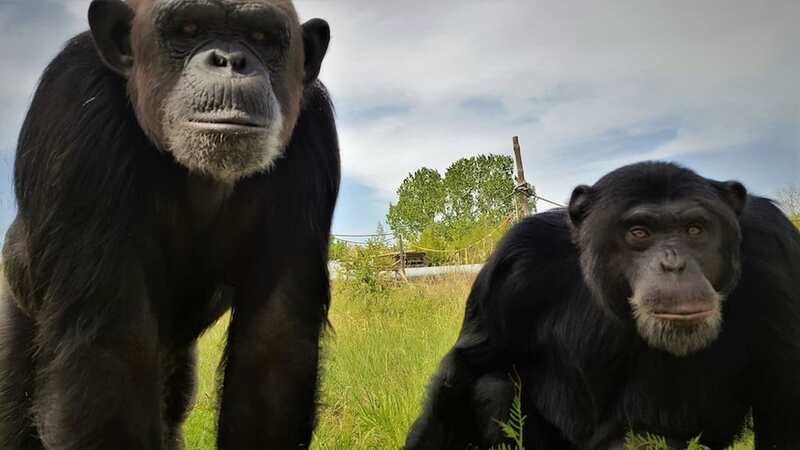 Young Chimpanzees can survive without their mother after they are weaned, with an older sibling or close relative often assuming the role of caretaker. Bonds between siblings are strong, as multiple young of different ages may be travelling with their mother at any time. Apart from humans, chimps are the only animals that not only attack intruders, but also penetrate into neighbouring territories with the intention of harming and killing those encountered. Swelling of the females genital area communicates their sexual state to other members of the community. It is highly visible, even at a distance. Younger males tend to groom older or more dominant males more often than the other way around. Males frequently groom females, but are more inclined to do so when females are in oestrus. Pan troglodytes is known to attack, kill, and consume members (mostly offspring) of the neighbouring communities. When males kill and eat the offspring of a female, what they try to do is ‘eliminate the genes’ that are not theirs. The scientific name for this species is somewhat misleading. Pan refers to the Greek god of forests, so it is quite appropriate for these animals. However, the term troglodytes means one who crawls into holes or caves. As explained, chimps do not typically use caves. Erection of body hair is a signal of excitement, being an automatic response to a new or frightening stimulus.